This report is about the economical, political and social situation in Greece. I ‘m 26 years old unemployed Greek and I am member of Xekinima – CWI (Committee of a Workers International) which campaigned along with other left groups in Greece and with SYRIZA for the “NO” vote in last Sunday’s referendum. What was the mood in society? The referendum gave breath to the people, and gave them the chance to decide about the future of our country. Over the last five years the governments didn’t ask the Greek society about the memorandums which brought a very cruel austerity in the country, followed by unemployment, closed businesses , poverty, and suicides. At the beginning the people were frozen by the capital controls and the bank runs, but in the next days people calmed down and started to think that ‘if we vote “yes” in the referendum, in some years we will not have any money in our banks and our life will be worse than now.’ The daily experience of the closed banks proved some facts to the Greek society. The majority of the unemployed didn’t have any money in the banks. The majority of the workers understood that they could take their wage over 5 days (60 euros per day x 5 days = 300 euros). The only social layer which had a really serious problem with the capital controls was the pensioners, and the majority of them voted yes. They panicked more than anyone else and most of them didn’t have cards for the ATMs so the government opened some banks so the pensioners could take some money from their pensions. In the queues at the banks the majority of people supported the no vote and the most common phrases amongst them were: “ I know that we will have a tough future but I say NO to the Troika, for me , for my children, and because we owe it to the history”. “We don’t want the future generations to think about us as cowards”. “I am unemployed , I don’t have nothing to lose, we will win our freedom if we vote No”. The mass media showed their dirtiest face the former week. They started a terror campaign against the No vote. And the result? It’s unbelievable, but people said no to the lies and the terror of the mass media and turned off their TVs! In the streets, in the banks, in the cafeterias you could hear people swear at the TV channels and the journalists! 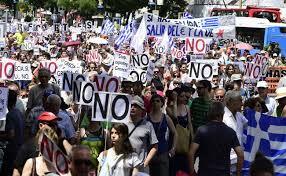 In the big demonstration of NO vote the last Friday the people have a very strong slogan “Punks, Pimps, Journalists”! Their terror attack lead a vast majority of the people to vote the opposite of what the channels and journalists supported! Now the people are asking the government to close the channels ( the mass media owe the Greek state 2.3 billion euros) because of their debt, and the prosecutors have started research about their attitude during the week before the referendum. After the referendum their attitude “changed” and now they seem to support a the Tsipras Government a little more . But when they find the chance they will hit again the government and the working class . The government should make them pay! Pay for their lies and pay for their debts! That’s what the people are asking! What did Tsipras do after the referendum? Tsipras made two big mistakes after the referendum. He’s made more than two the last months and we ‘ll see it in the near future, but in last Monday we saw very clear the reformist ideas which we have read about Marxist theory and in our history books. The first mistake was that he called the defeated leaders of the other parties to compromise! The winner called the defeated to talk and take decisions together! That is a huge mistake from Tsipras’s side. Their parties and their ideas are dead after the referendum. They have huge problems inside their parties and the people hate them and call them traitors. Tsipras is giving them the chance to survive in a political scene which changes ultrafast! The other mistake of Tsipras was that he changed the former minister of finance Yanis Varoufakis with Efklidis Tsakalotos. Let’s be clear, neither Varoufakis nor Tsakalotos are good enough for finance ministers because they are both on the right inside Syriza and they can not take radical left decisions. But Varoufakis was an noncomformist minister of finance who was hated by the other finance ministers of the Eurogroup and that’s why the Greek people loved him. Have you ever heard of any minister of finance, which workers, the unemployed and pensioners hug and kiss when they see him in the streets… even with the banks closed? Tsipras sacrificed Varoufakis in front of E.U. to gain their favor. That’s the truth and the opinion that says that it was a tactical move from Tsipras is wrong and void. What will happen the next days? There are two scenarios. The first is that Tsipras will compromise with the E.U. and he will sign with a new 3 years memorandum. That’s the bad scenario in which the Greek society will suffer for more years. If Tsipras signs the memorandum, Syriza could collapse under the pressure of its people and a new authoritarian government could show up. That will be the end of the left in Greece for many years in the future and of course the working class could be smashed under the pressure of a new memorandum. The second scenario is that Tsipras will not accept the memorandum and the Europeans decide to kick out Greece from the Eurozone. How this will happen? I will try to explain that complicated issue with few phrases. The European Central Bank will stop supporting the Greek banks and the Greek Government will decide to make a new currency. If Tsipras decides to take that road, he must nationalize the banks, the energy company, pharmaceutical companies and food companies if we want to overcome the crisis in a few months. The few months would be hard for the Greek society, but if Tsipras takes those steps, during that month and the next year we will be talking for the miracle of Greece! *Note: Oaklandsocialist thanks Comrade Spanoudaki for taking the time for writing this report. 15 Now or 15 Sometime in the Future?